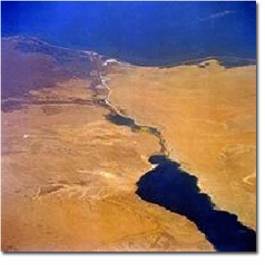 Thought on digging the channel through Isthmus of Suez, has arisen in an extreme antiquity. Antique historians, in particular Strabon and Pliny the Senior, inform that the channel connecting the right sleeve of Nile with Red sea, Pharaohs of an epoch of the Average kingdom tried to build still Phivani. The first authentic historical evidence of connection of the Mediterranean and Red seas the channel concerns times of board of Pharaoh Neho II (the end VII-The beginning of VI century BC). Expansion and channel improvement was made under the order of the Persian tsar Darija I who have won Egypt, and subsequently- Ptolemej Filadelf (first half III century BC) . However in 767 the system of the channels connecting Nile with Red Sea, has been destroyed by order of the Arabian Caliph al-Mansur. Since then any works on restoration of this ancient trading way it was not conducted. Preconditions for realization of technically difficult and labor-consuming project have appeared only during new time. Building of Suez Canal is connected with Ferdinand's name de Lessep, the French vice-consul in Alexandria in 1832-1833 and the consul in Cairo in 1833- 1837. Having conceived this grandiose enterprise, Lessep has come into friendly contacts with deputy Egypt Mohammed Ali. However Lessep and did not manage to be convinced of necessity of building of the channel Ali, its successor deputy Abbas I. Nevertheless, eventually, the persistence of Lessepa has been rewarded: on November, 30th, 1854 it has received from hands of replaced Abbasa-1 - deputy Saida the desired decree which has given to it concession on building of Suez canal. Thus Lessep has been named in the text of the decree by words “Our friend”. The French contractors of Linnan de Belfon and Muzhel have made the contract design of a line of Suez canal. Its bookmark has taken place on April, 25th, 1859 this day Lessep with councilors of the company and has arrived into place where the city of Port Said named so in honor deputy Said has soon grown. After the short speech devoted to significant event, Lessep with own hand has spent the first furrow on a line designating a contour of the channel. On a channel construction it has been simultaneously occupied from 40 to 60 thousand workers. Provide building by a labor of Lessep smog, only having achieved at deputy Said of the edition of the decree about compulsory mobilization of peasants. It was ordered to rural heads to drive on building of inhabitants of nearby villages. Because of intolerable working conditions on building of Suez canal, according to some information, was lost to 120 thousand Egyptians. During the first period of excavations almost all became manually. The friable soil did not allow to carry a ground in wheelbarrows, and quite often it was necessary to lift a wheelbarrow and on hands to bear it to an unloading place. Difficulties were aggravated with that the district chosen for the channel, was crude and marshy. In March, 1869 of water of Mediterranean sea Bitter lakes, and in half a year, have rushed on November, 15th in lying on a channel line, solemn opening of the channel has taken place. ..В 8 hours of 15 minutes of morning on November, 17th through the channel the yacht of the French empress has moved ”Egel”. Behind it- Frigate of the British ambassador, and then already a chain of various courts. The waterway has been designated by red beacons. About 8 o'clock in the evening, near to Ismailia the caravan had to rise on an anchor: a steamship “Peluziy” sat down on a bank also has blocked a way to other ships. Then new complications began to arise: it has appeared that in several places the channel was nearly twice more small planned 8 m.
All night long there was a meeting. It has appeared that in deadly haste had not time to finish work on deepening of the basic channel of the channel, and instead of the provided 8 m of depth in many places it has appeared much less. It threatened pass of the ships with big depth. The majority of participants of meeting tended to postpone opening solemn ceremony. And during this critical moment only one Lesseps could keep cool. Under its insisting the strong-willed decision was accepted: to open the channel and to pass a part of the ships of small displacement. Suez Canal connects Port Said on Mediterranean Sea and Suez on Red sea. Transportation of cargoes through the channel remains to one of the cheapest and safe ways of transportation of the goods between Europe and Asia. Opened for navigation in 1869 the channel long time was under control of Frenchmen and Englishmen. On July, 26th, 1956 the president of Egypt -Gamal Abdel Naser declared its nationalization.